As the nights draw in and the temperatures head from chilly to downright cold, we’re getting our first big winter donation truck ready to support thousands of displaced people sleeping rough on the streets of France. And we need your help to fill it. Imogen, who runs ABC explains, “There is a growing belief that less and less refugees are trying to reach the UK because the camps in Dunkirk and Calais have been all but destroyed. “However, hundreds of people are arriving in France every day and Paris in particular has been effected with thousands of refugees and asylum seekers sleeping rough in absolutely horrific conditions. The conditions in France mean that families, including estimates of hundreds of children, are sleeping on concrete and bare ground under tunnels. They’re cold, scared and exhausted, and are regularly moved on by the authorities as conditions become unsanitary. We know the people of Bristol care – you’re the people that make ABC’s work possible. 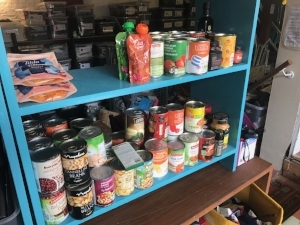 So we’re ramping up our pleas again for items such as winter clothes, sleeping bags, tarpaulins, backpacks, hygiene and sanitary products and packet or tinned food and drink. Check out the full list at the bottom of this post. We’ve got two weeks to fill that truck! Our first truckload is heading to France on the 18th October, where our trusted partner organisations will distribute your warm, practical, and potentially lifesaving items to the people who need them. “We are once again looking at a humanitarian issue where masses of vulnerable people are left with zero comfort, protection, or even granted basic human rights,” says Imogen. Got warm clothes or other stuff to donate? Check out the donations list below and bring your items to the Hub - 5-7 Waverley Rd, Redland BS6 6ES. We’re open Tues - Thurs 11-3, or leave your donations in the donation bin outside anytime - it is emptied daily. You can also donate money to help us distribute the supplies. Mens (s/m) brand new socks and underwear. As always, we are hugely grateful for any donations of aid, money or time you can give. It all makes a difference. So thank you. The ABC Free Shop opens 15th March!